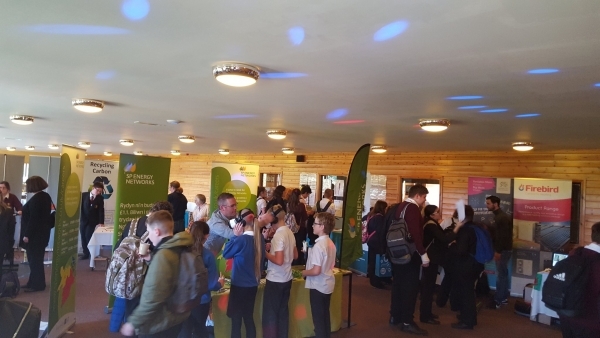 We attended the Big Bang over the full 4 days of the event in 2019. 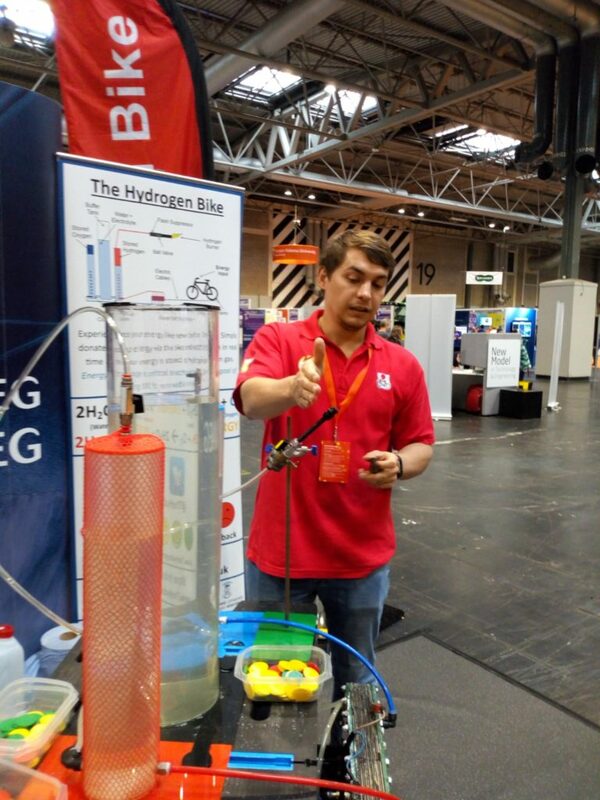 Birmingham NEC was the venue and it was a great experience. 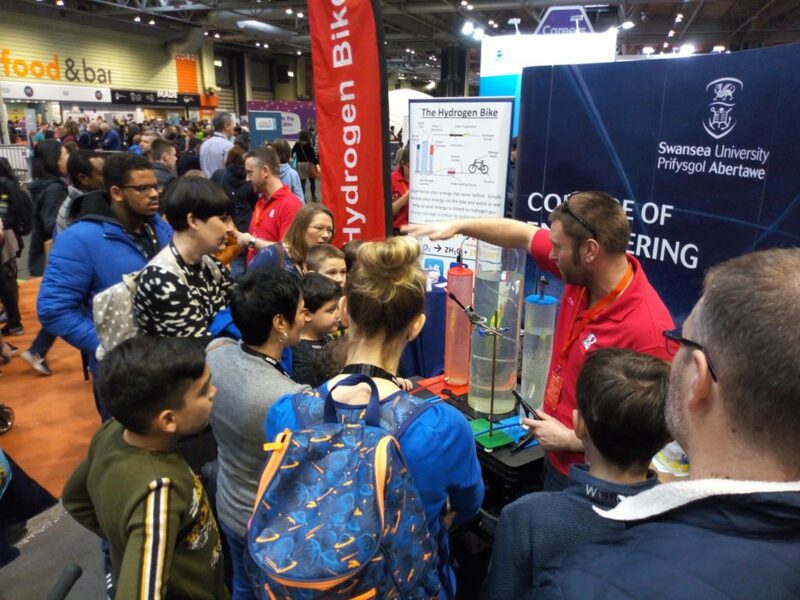 This year we split the team into 2 teams one for the set-up and the first 2 days and then the other team for the final 2 days and the takedown. 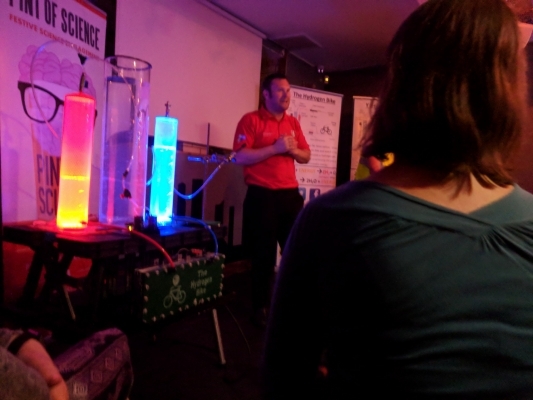 Much better experience for the event to not do the full 4 days in a row which was exhausting from previous experience in 2017. 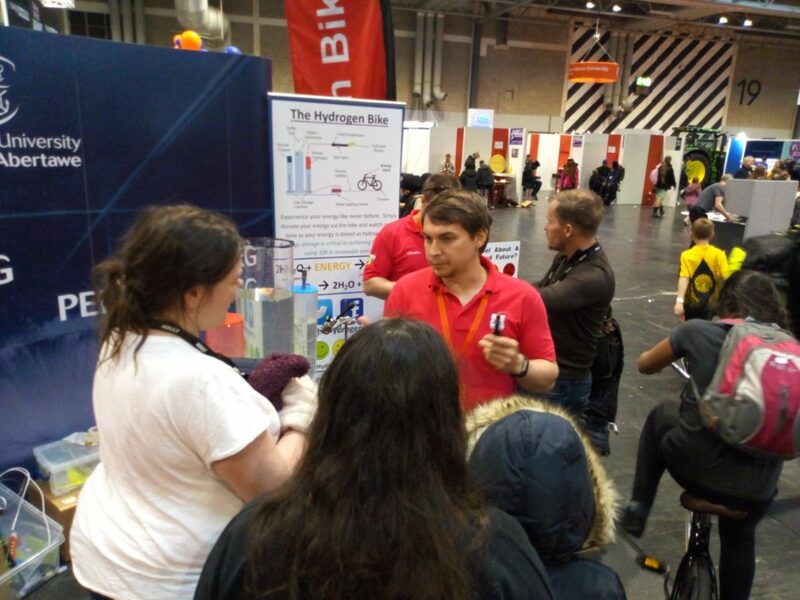 Ove the course of the 3 days we spoke to and gave tokens to 3055 people which was a hell of an achievement. 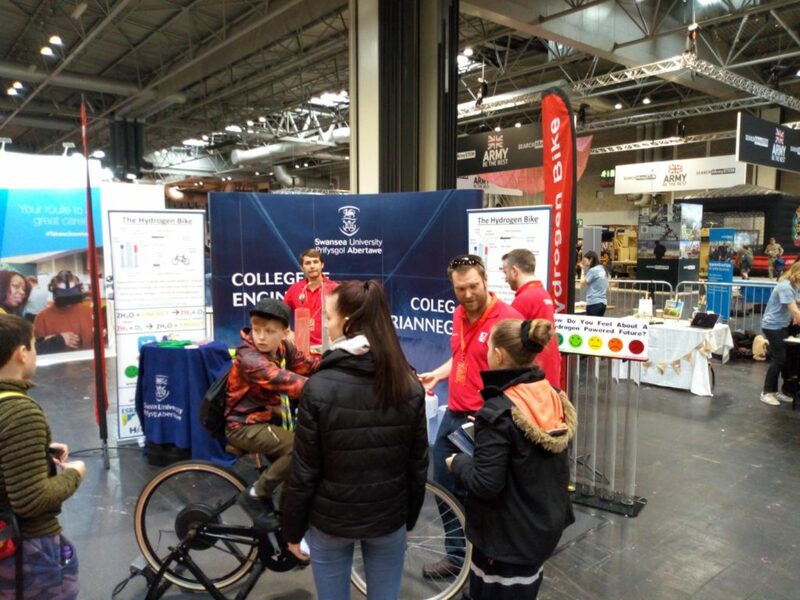 massive thanks to Swansea uni who gave us some money to cover travel and accommodations as well as a couple of student ambassadors to chat to people about engineering degrees at Swansea. 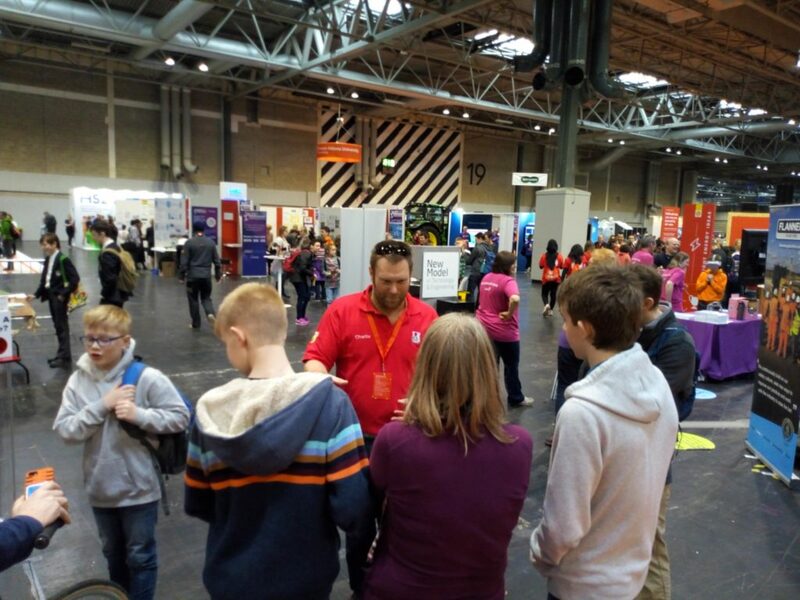 The individual statistics for the days are shown below shows just how much of a fantastic time we had.. 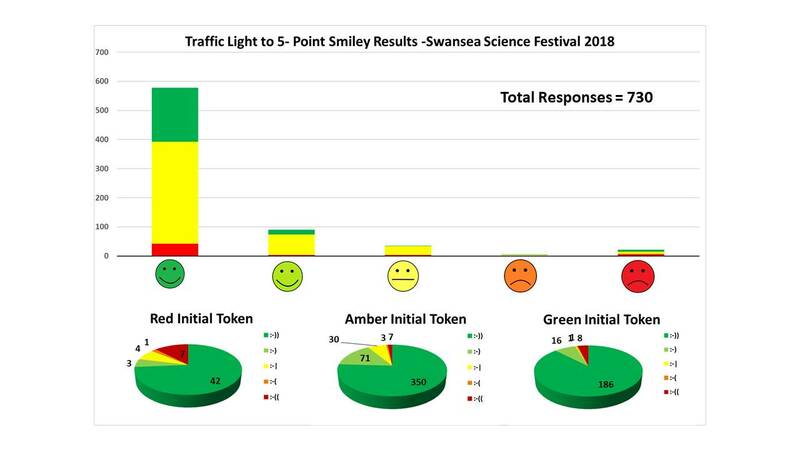 The combined statistics are shown here to give a flavour of the event in total. 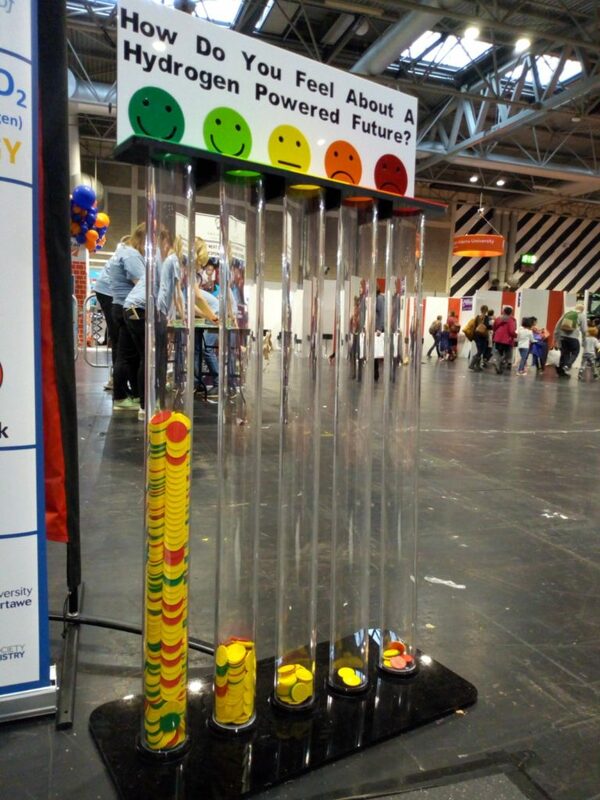 As you can see we had 3055 conversations with again as expected an overwhelmingly positive skew to the data. 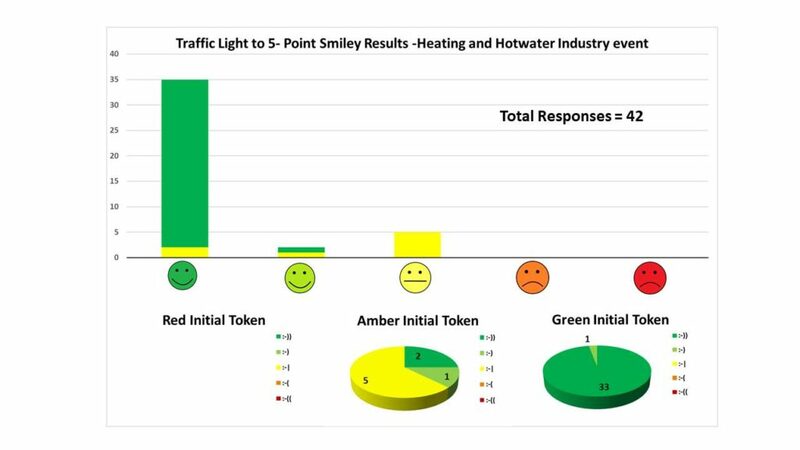 The vast majority of respondents did not have a prior opinion of hydrogen and therefore received a yellow token. 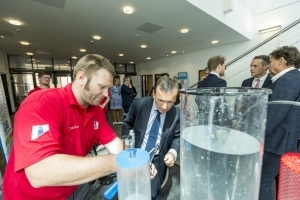 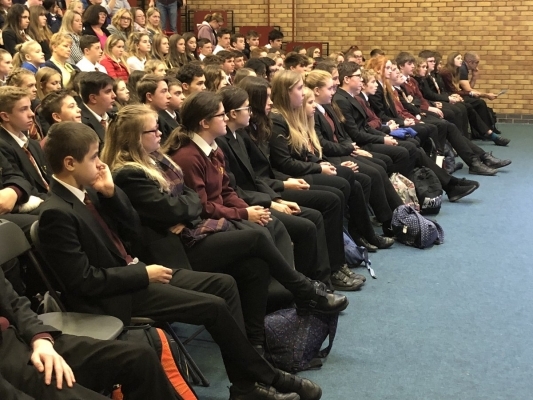 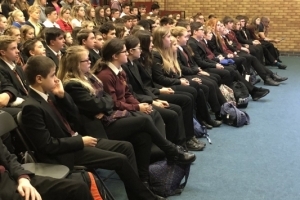 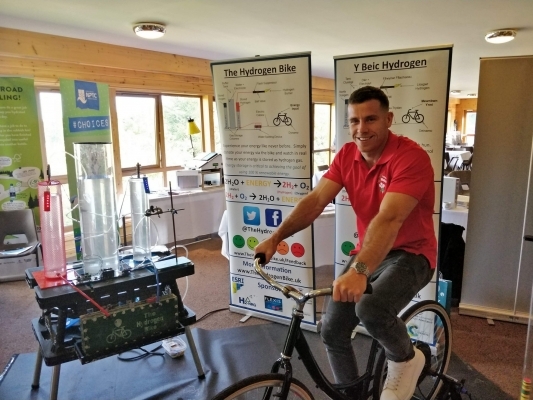 This is not surprising given the nature of the event however there were lots of older students coming to the end of their A-levels who would have had a pretty good idea about hydrogen and it's possibilities both positive and negative. 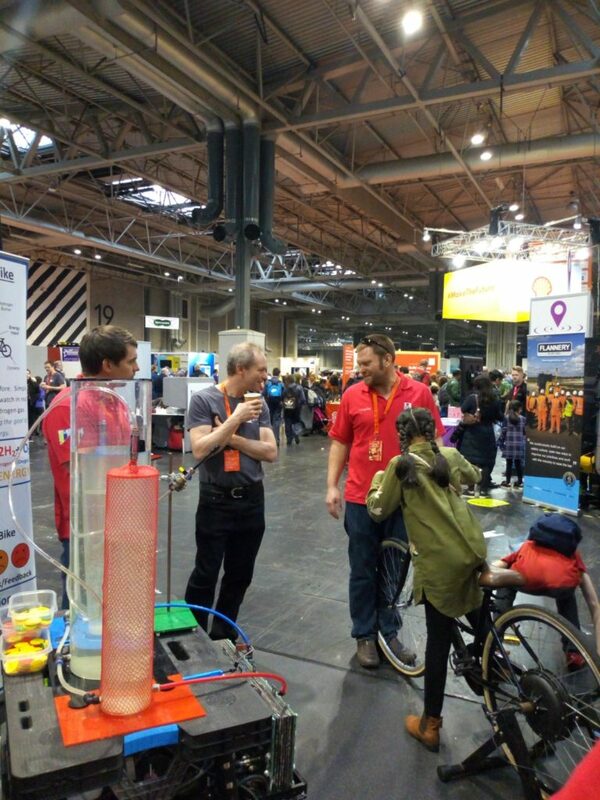 Day 4 was very much the family day so there was a shift in audience perceptions. 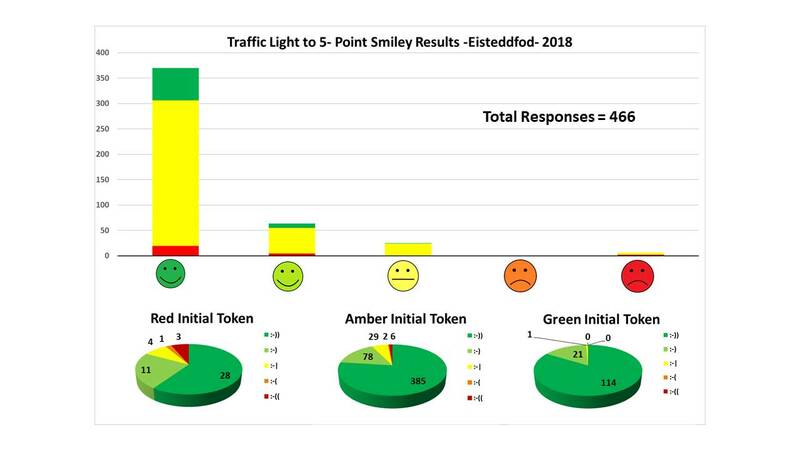 The proportion of the respondents who were adults and had an opinion was higher as seen from the greater proportion of red and green tokens on this day. On the 4th December Charlie and Kat travelled to Stoke on Trent to see our new friends at the Heating and Hot water Industry -Low Carbon Forum. 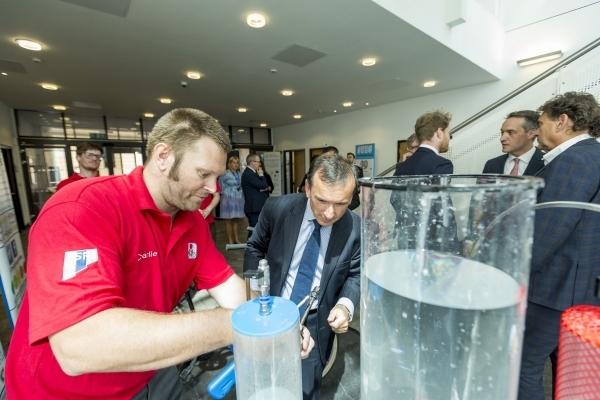 The event was a great opportunity to talk to a targeted audience of people involved in gas networks and with an interest in the use of hydrogen primarily for heat. 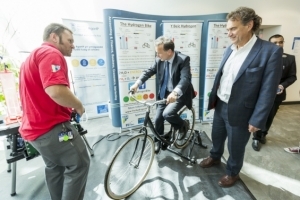 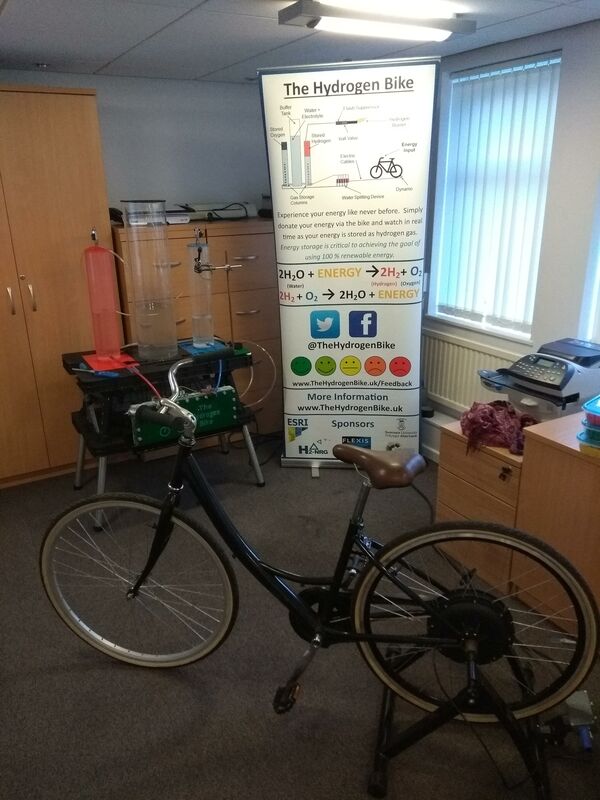 We set the bike up n the reception and attended the conference with people coming and having a go during the lunch and coffee breaks. 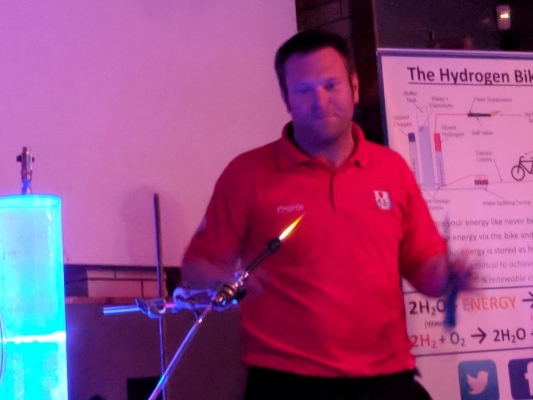 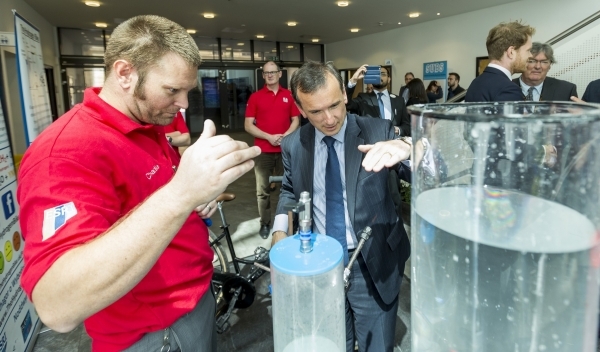 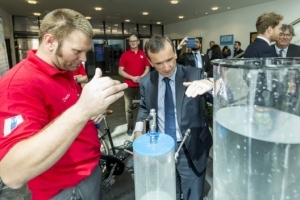 For many it was the first opportunity to actually see hydrogen in real life rather than just in the presentations. 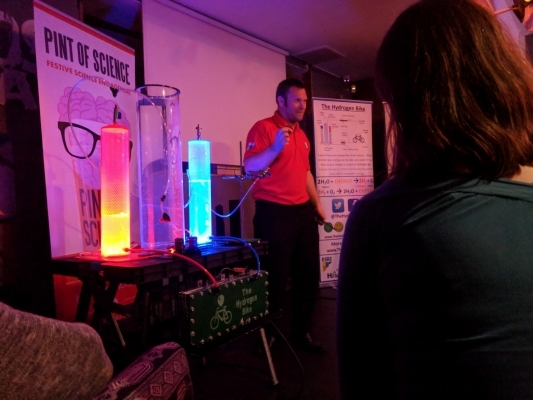 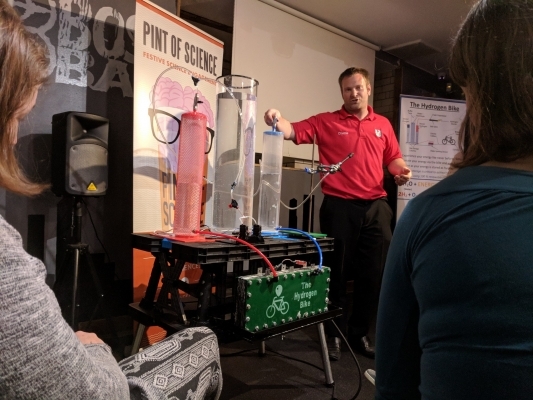 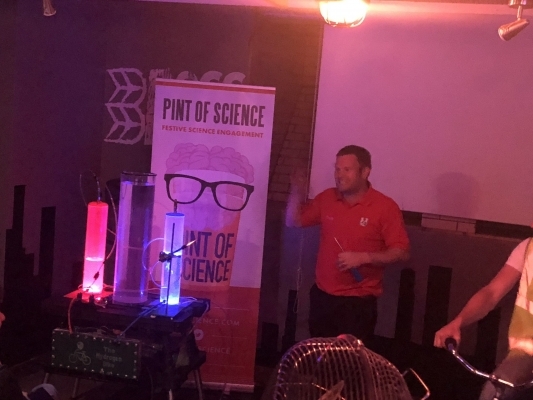 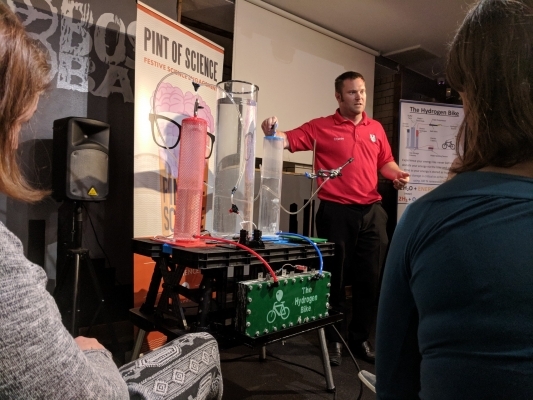 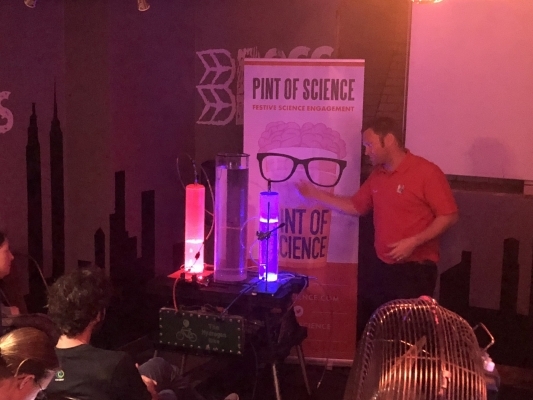 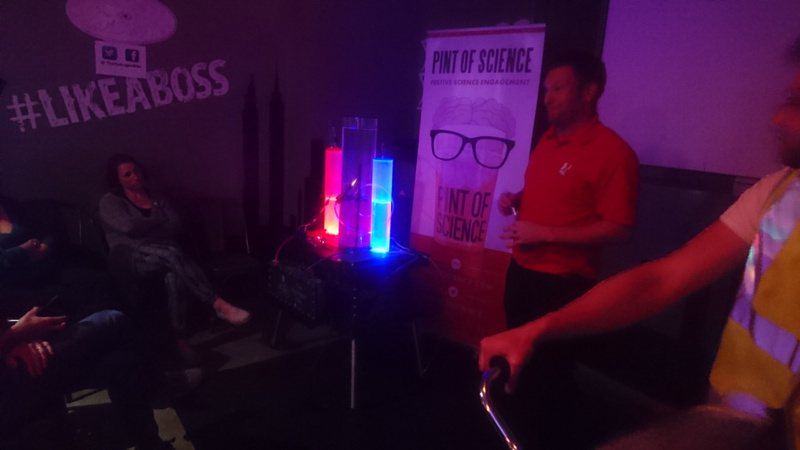 This was really interesting as many of the people attending knew lots about Hydrogen and potentially had a positive opinion. 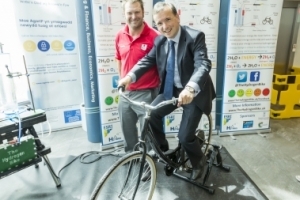 this is to be expected at a conference on decarbonising the gas networks as hydrogen would inevitably play a large part. 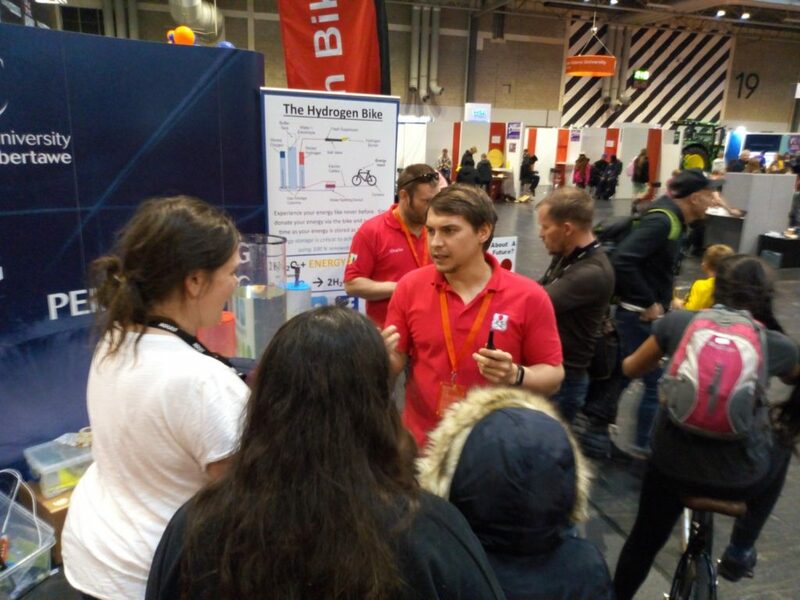 The people who had no opinion before interestingly mainly didn’t change their opinion though on talking to these people we discovered that they were in more than one case answering the question of how likely a hydrogen future is rather than the how do you feel about a hydrogen powered future. 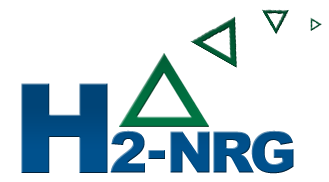 They expressed opinions that the conversion to hydrogen was too big a job and that they had little faith that we would be able to do it.. 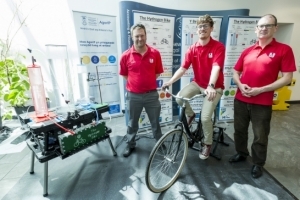 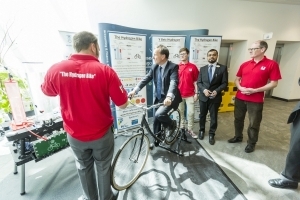 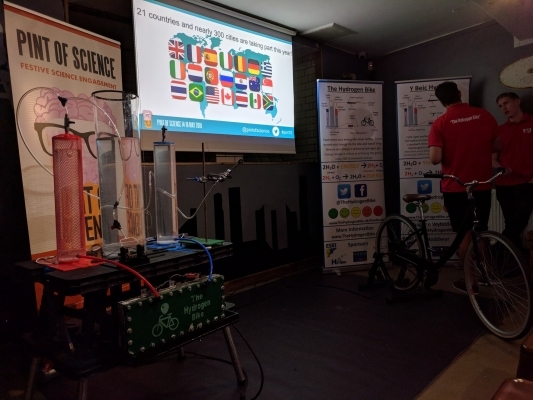 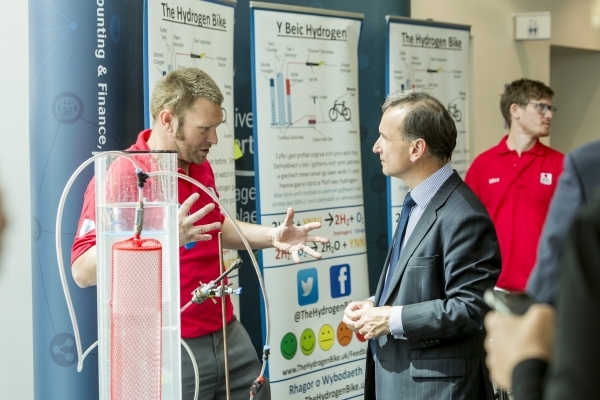 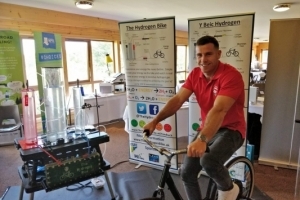 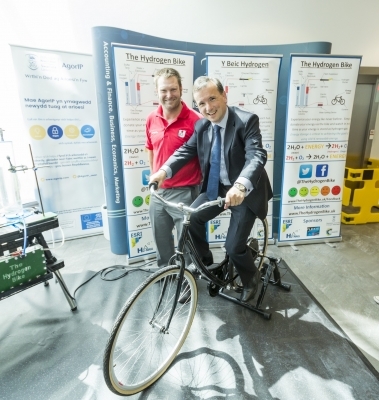 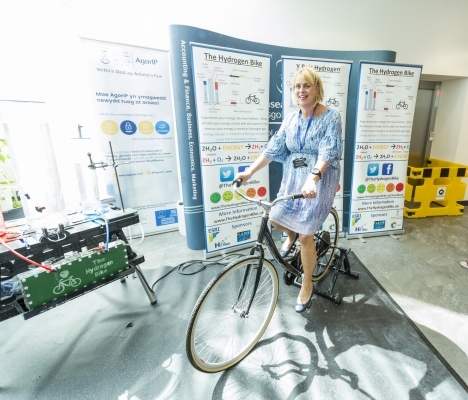 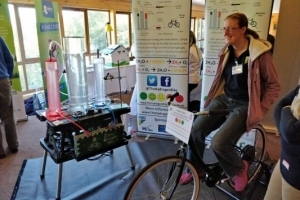 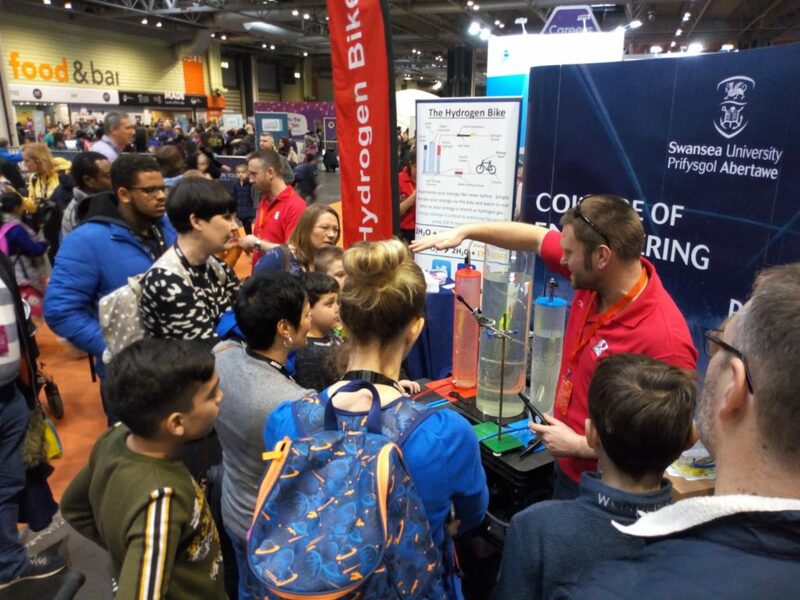 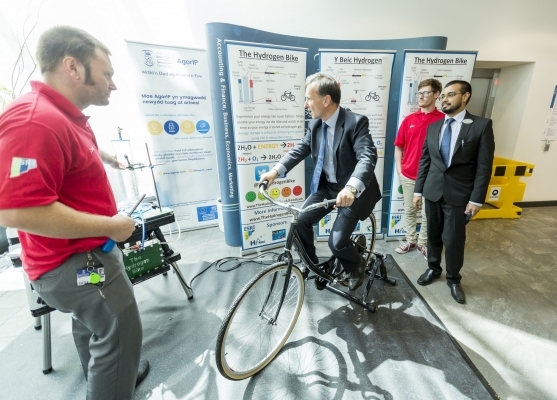 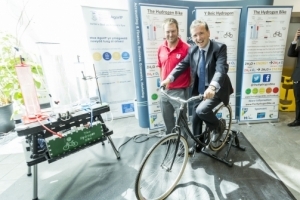 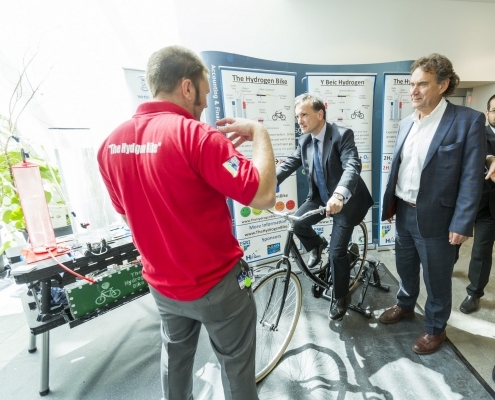 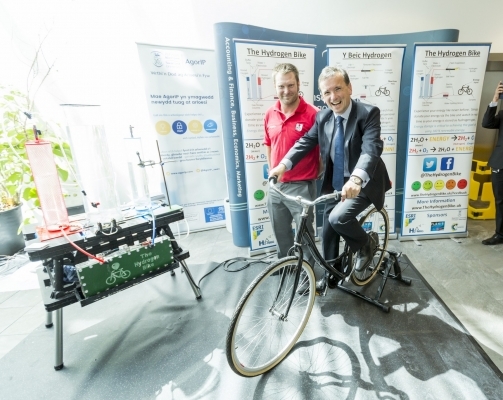 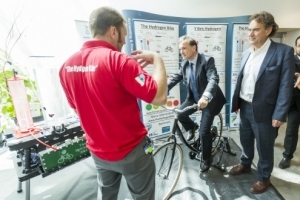 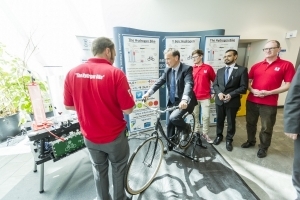 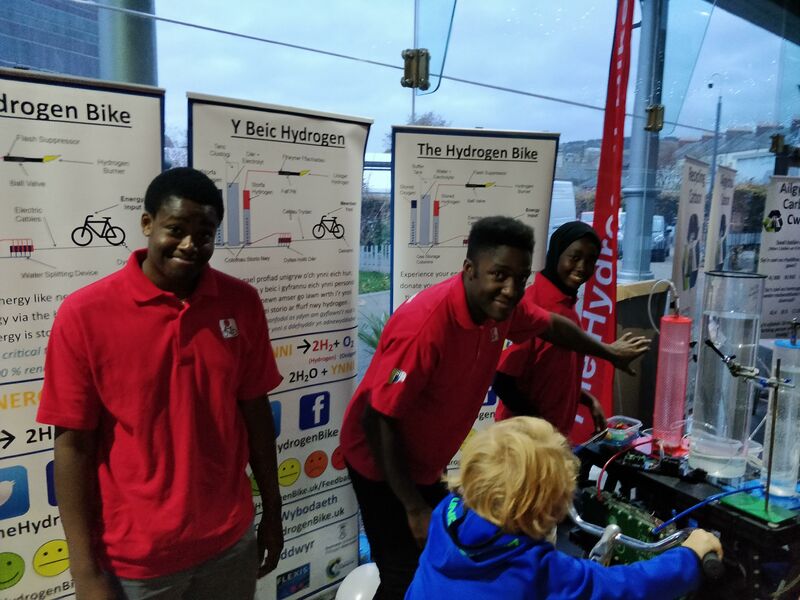 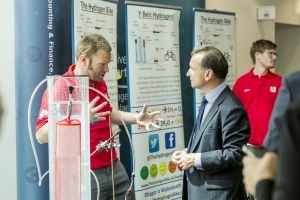 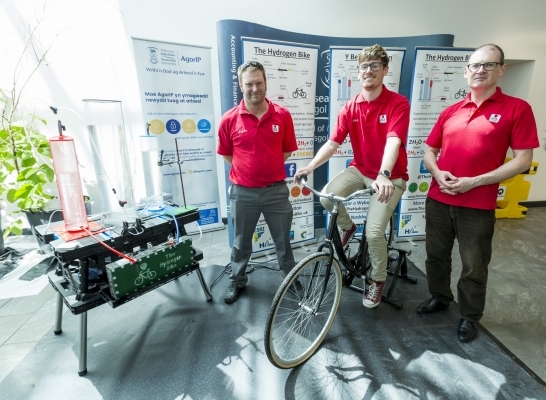 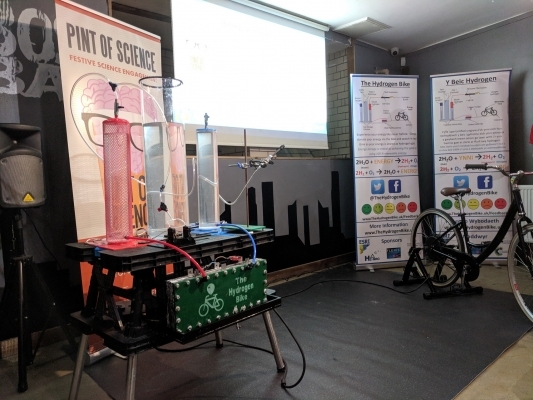 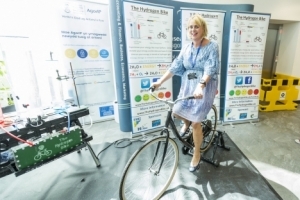 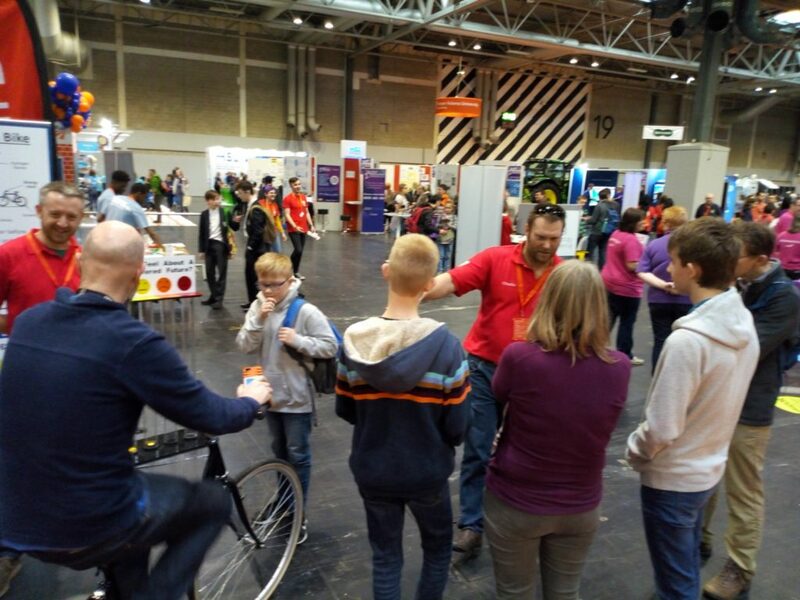 The Hydrogen Bike was at Swansea Science Fair on the 3rd and 4th October, at the National Waterfront Museum, a huge showcase of science from across Swansea University. 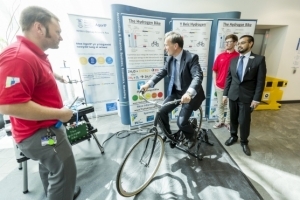 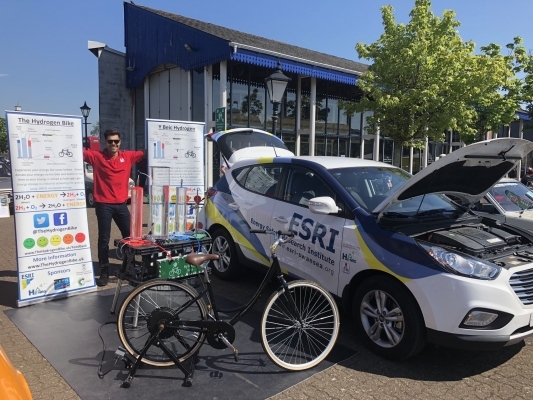 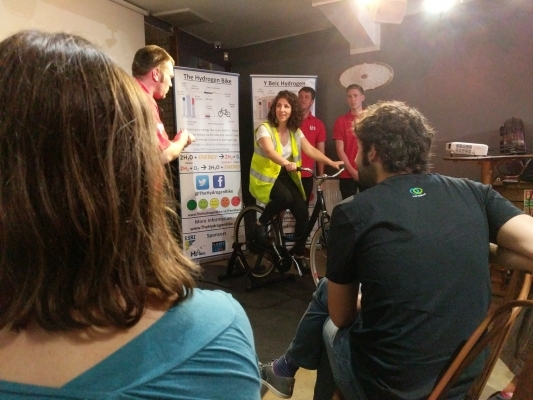 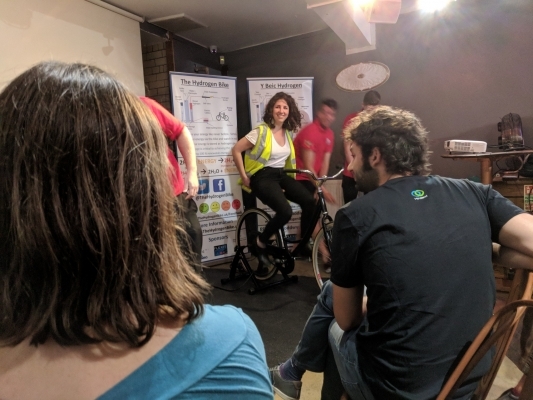 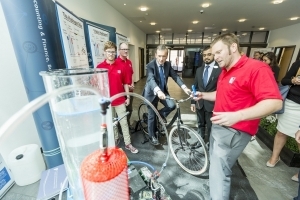 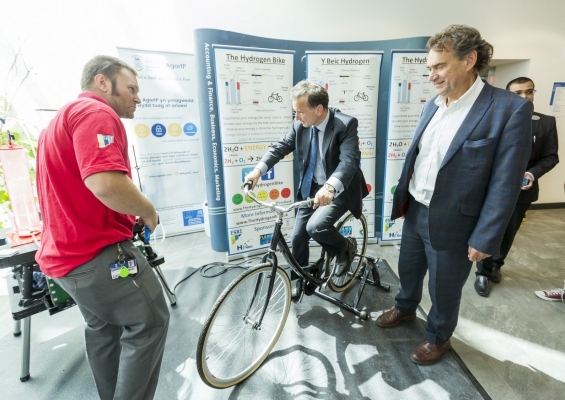 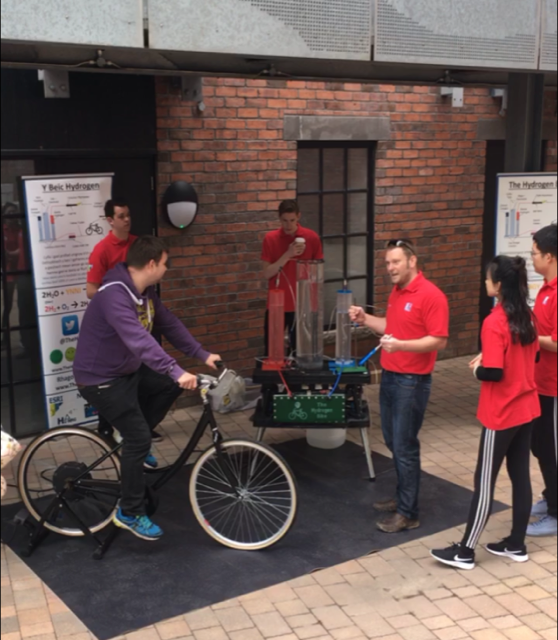 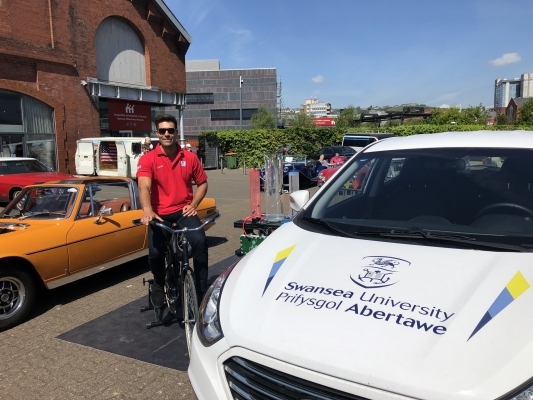 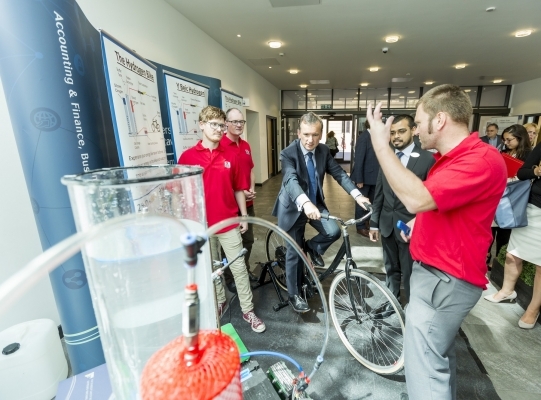 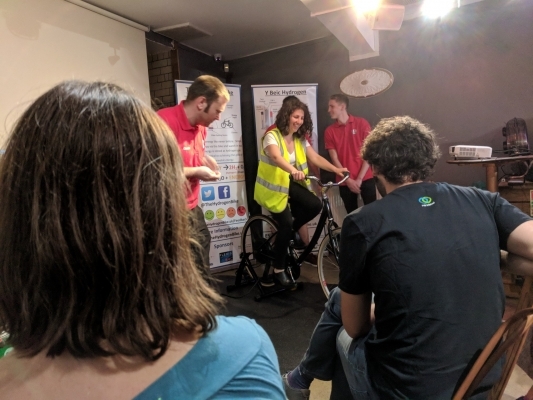 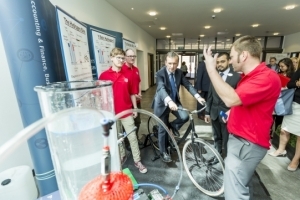 Undergraduates and master’s students as well as staff member all contributed to the successful running of the Hydrogen Bike over the weekend. 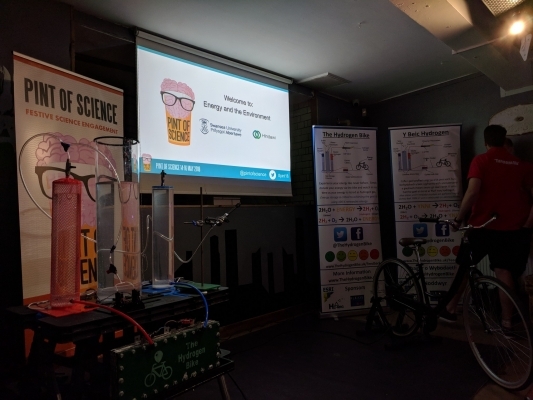 Lots of kids hopped on the bike, donated their energy and were chuffed to see bubbles being produced and their efforts turned into a hydrogen flame. 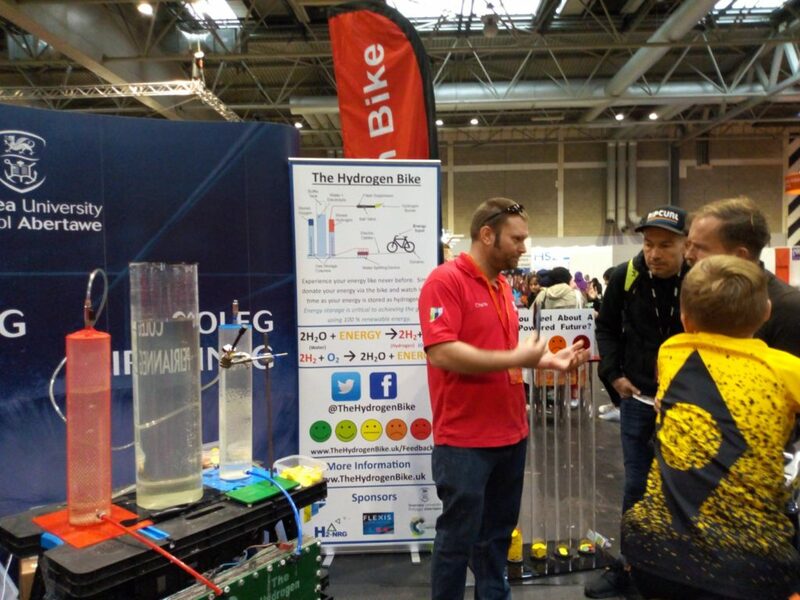 We had conversations with people of all ages, including my favourite where one visitor said ‘I thought you would just have a digital display saying ‘This is how much hydrogen you would have produced’. 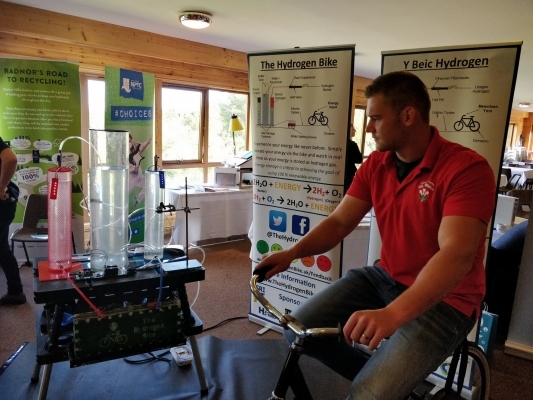 You’ve got actual hydrogen!’ Loads of good conversations about hydrogen and lots of positive impact on the concept of a hydrogen powered future. 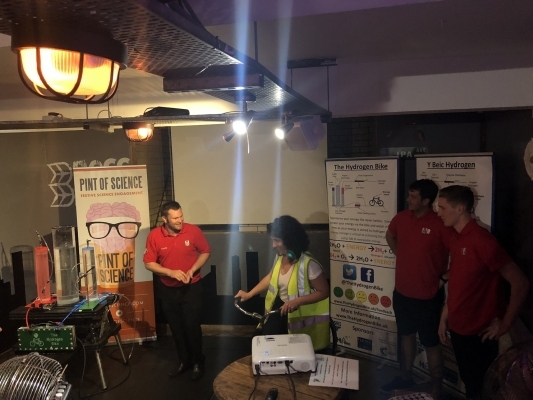 HUGE thanks to Kat, Dan, Jainaba, Joshua and Gwynfor. 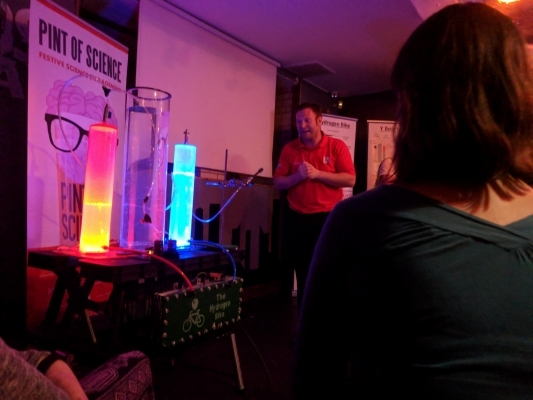 they did s fantastic job and put in loads of energy and enthusiasm. 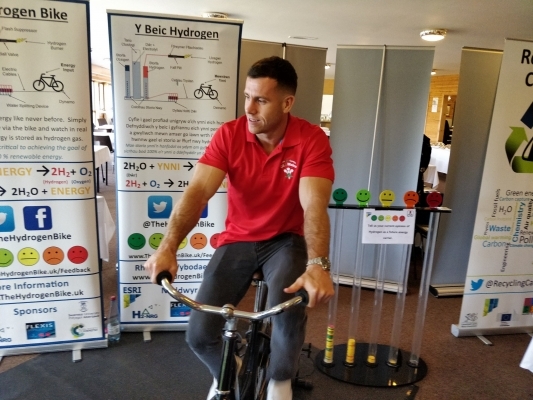 The Hydrogen Bike was at The National Eisteddfod in Cardiff Bay. 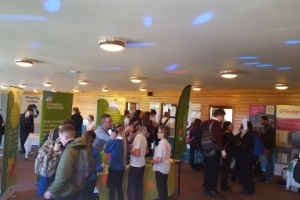 The Eisteddfod is reportedly the largest cultural festival in Europe and is a very ‘Welsh’ event with a long history, and is based around singing, poetry and dancing competitions. 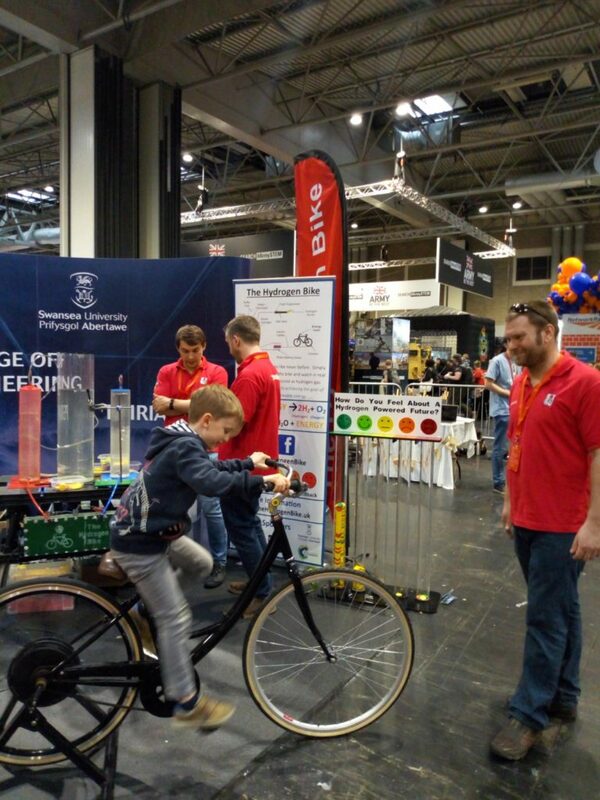 The Eisteddfod is very much a family occasion and over time it has also come to include a small science village which is heavily supported by the universities. 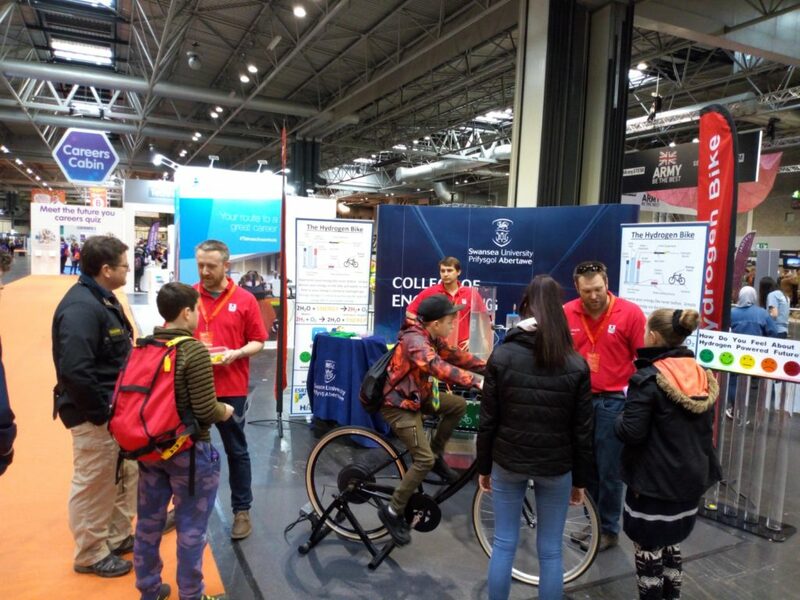 The event is covered extensively by the BBC and S4C, and we managed to get one of the S4C presenters on the bike interviewing Bill. 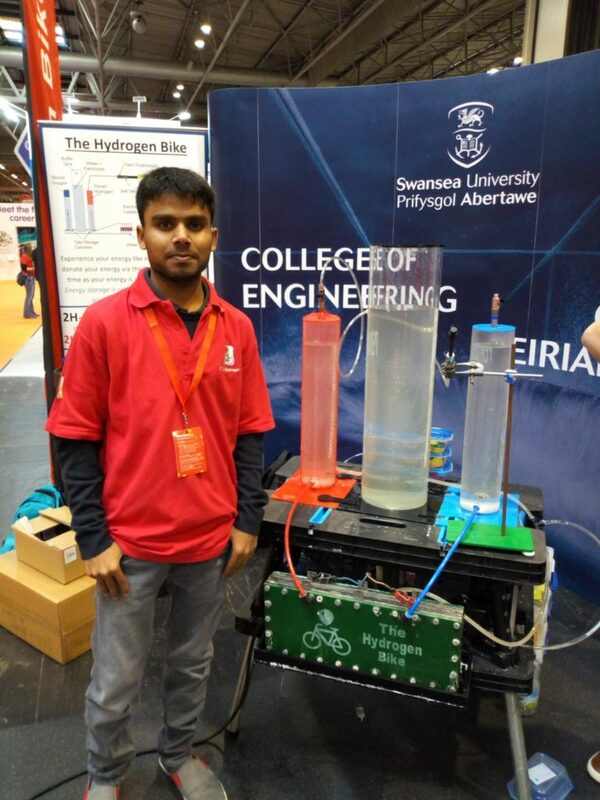 If you follow the link and go to 08:19 you can see the interview https://www.bbc.co.uk/iplayer/episode/p06fpqh9/eisteddfod-genedlaethol-cymru-cyfres-2018-wed-08-aug-2018-2130#subtitles are available in the bottom right hand corner. 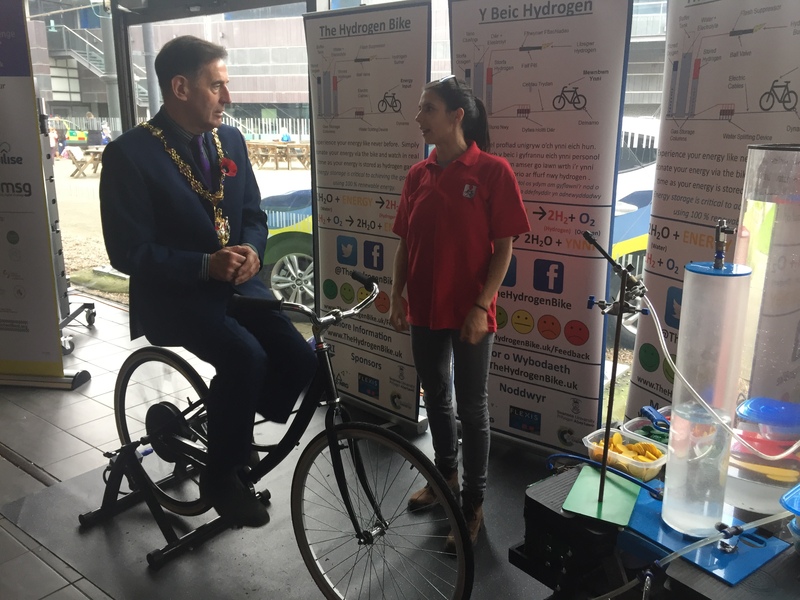 HUGE thanks to Bill and Eira who attended and ran display this occasion. 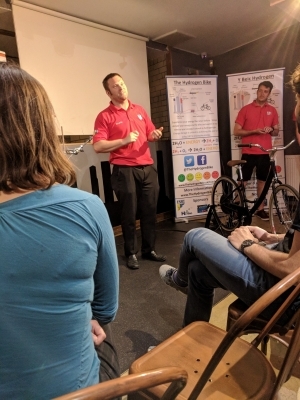 Dr. Mike Warwick and Jon Amirmadhi took the bike to this event. 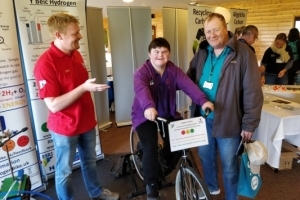 On Saturday (19-5) Jon and I attended the sixth “Wales on Wheels” event held at the Waterfront Museum in Swansea. 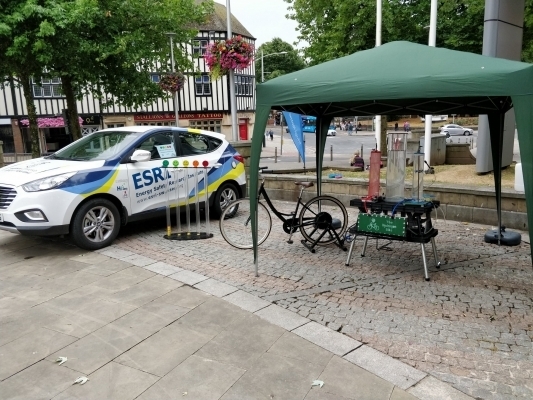 The event showcases diverse types of historic, vintage and classic vehicles from around the country and displays them in the square. 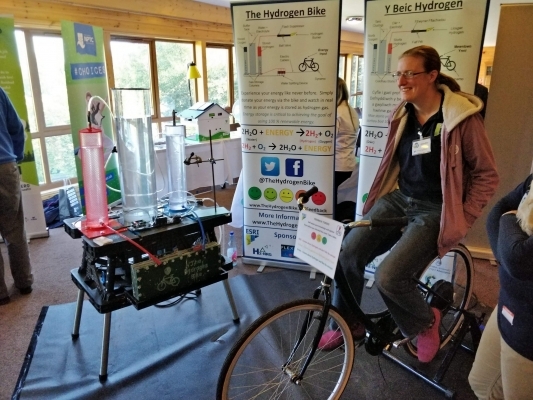 We went along with both the hydrogen bike and car and were set up outside with all the other vehicles. 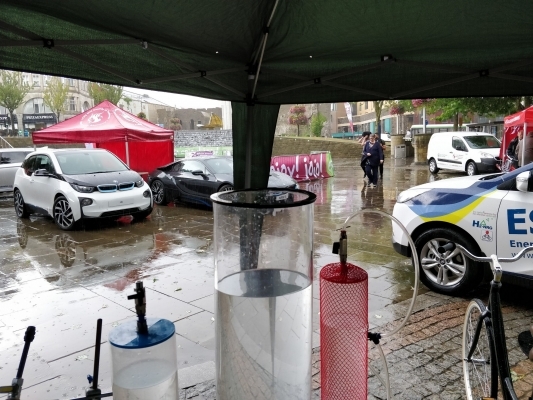 Due to the nature of the event showcasing cars I was expecting people to be sceptical of the idea of hydrogen being the fuel of the future. 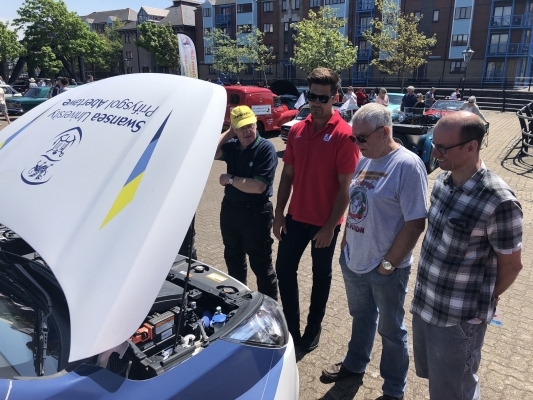 However, the response was positive overall with many people commentating that this is what cars should be aiming at becoming and all very interested to look under the car bonnet and see the hydrogen fuel cell. 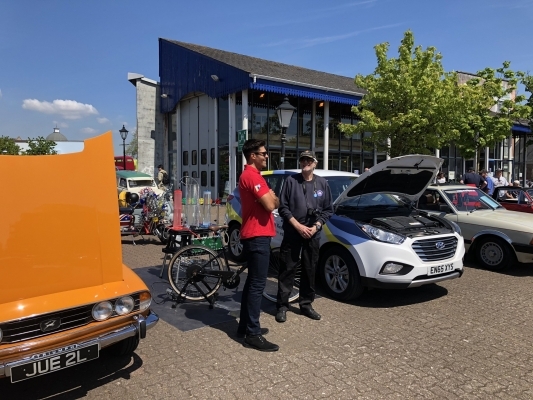 It was an amazing day (helped by the beautiful sunshine) and lead to some interesting conversations with real car enthusiasts. 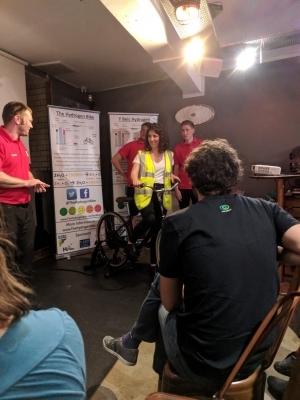 HUGE Thanks to MIKE and JON for taking the bike to this event. 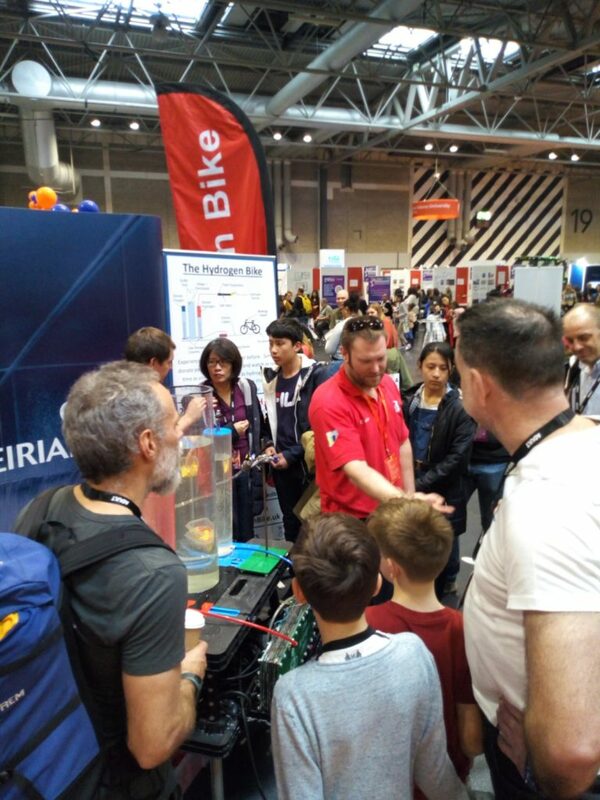 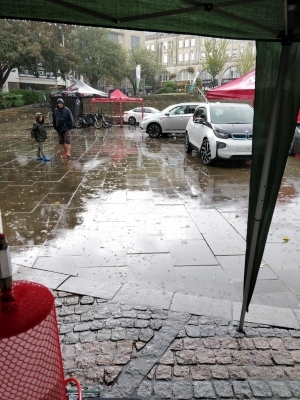 Lot of people came to see the hydrogen car so many green tokens given out with people who like the idea of hydrogen in cars. 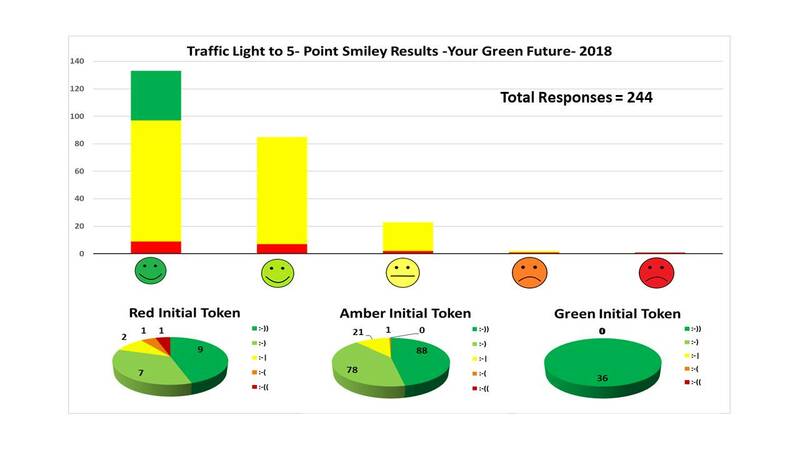 The expected green skew is present as always with 16 people who before had no opinion about hydrogen now having a positive concept. 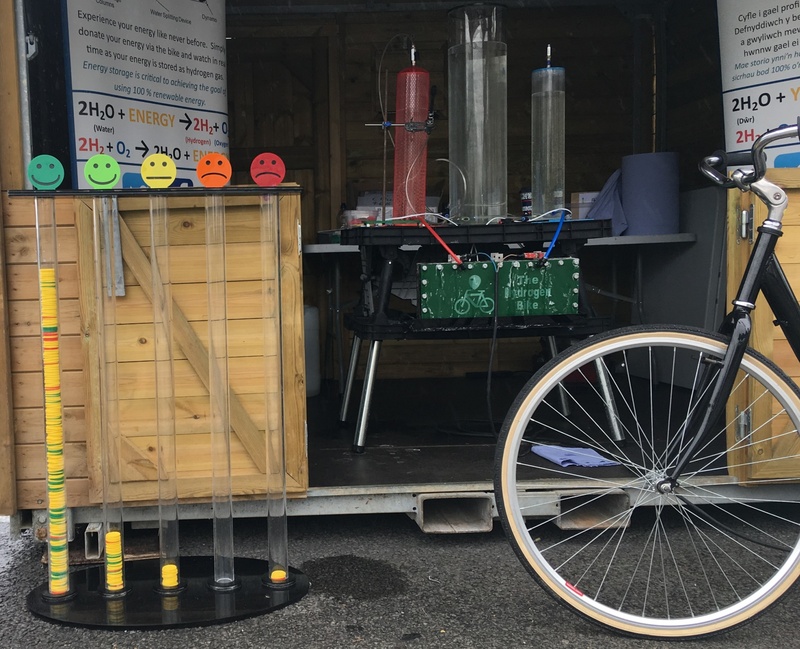 Of the three red tokens given, one remained unconvinced however the other two ha a more positive opinion of hydrogen after the event. 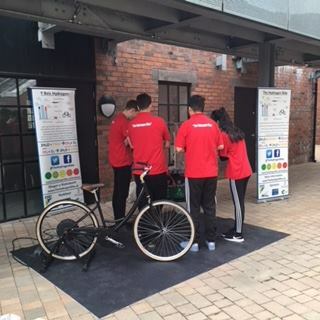 Saturday the 28th April we attended the Jamberi Festival in Swansea and were based in the TechHub. 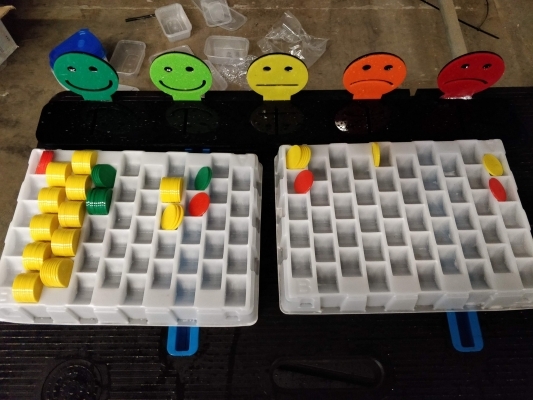 We had a quiet day but managed to test out our new 5 point smiley system to measure impact. 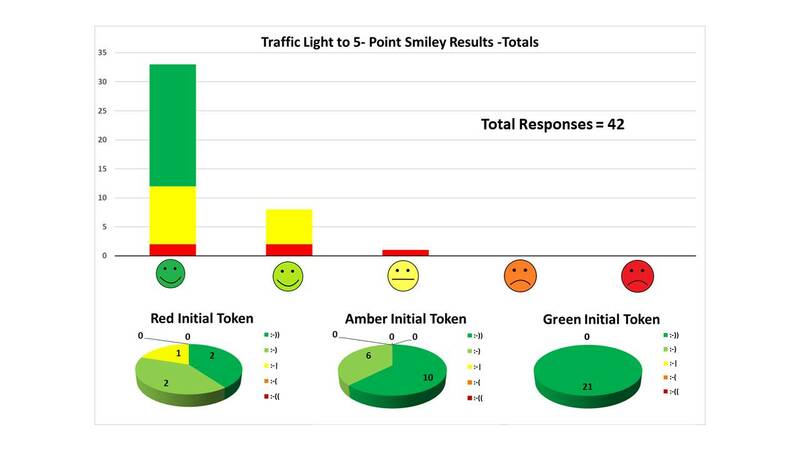 Results are shown below. 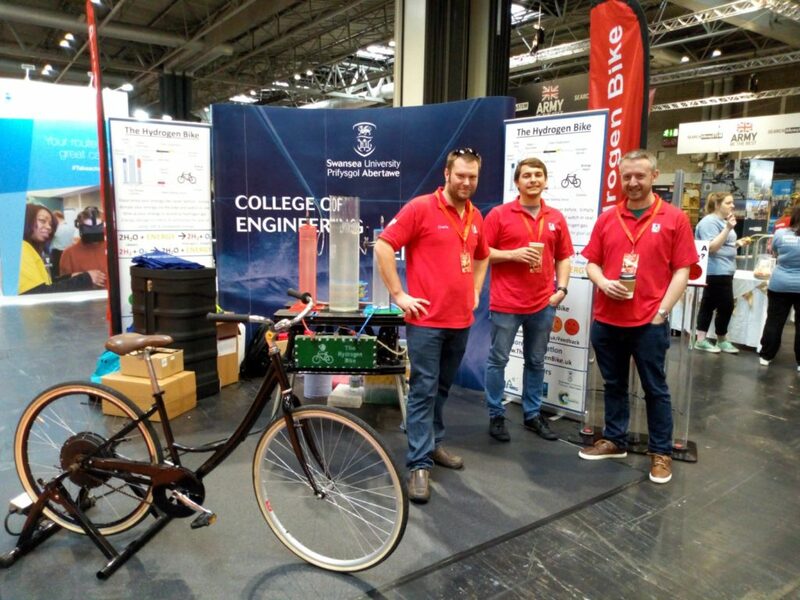 Big thanks to my team who turned out to help. 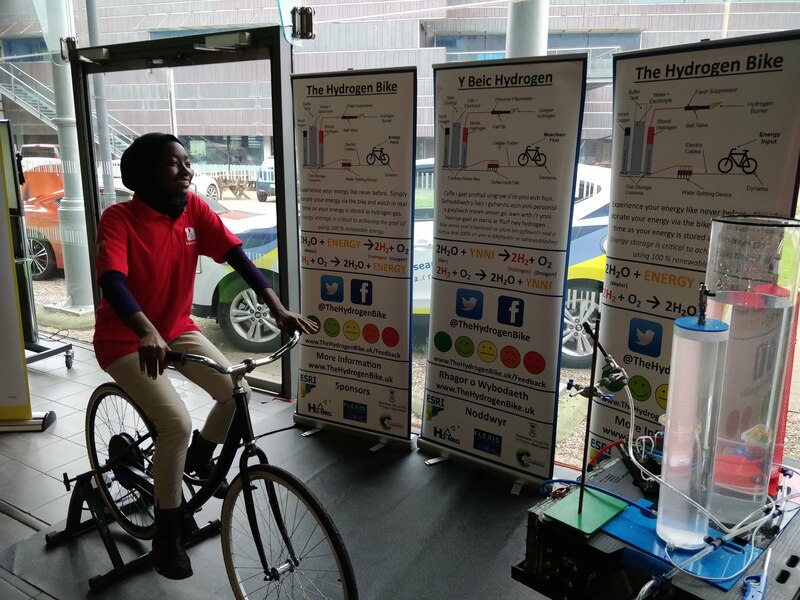 We even had a couple of third year students helping out the PhD students with the outreach, which was lovely to see. 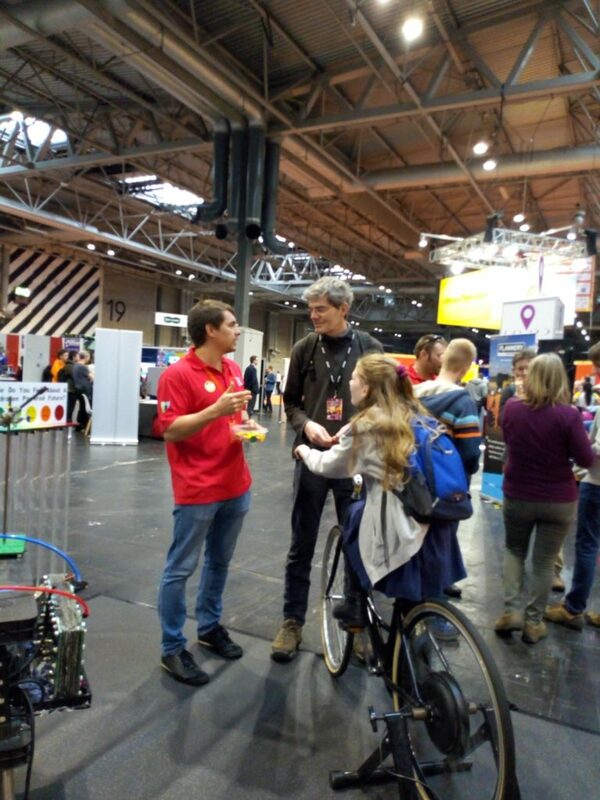 Great also to see the new red T-Shirts. 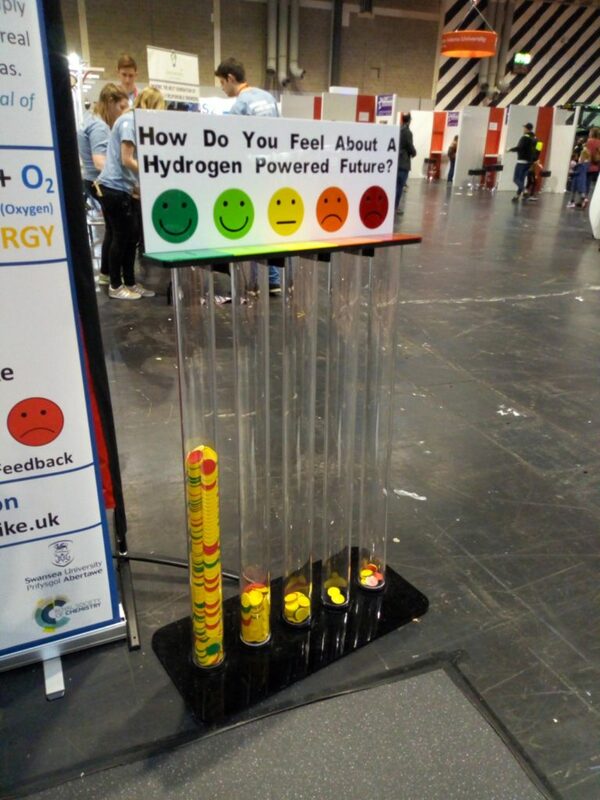 Bar graph: A large skew in the results towards the green end of the smileys indicate a generally positive attitude towards hydrogen and its’s future use after the event. 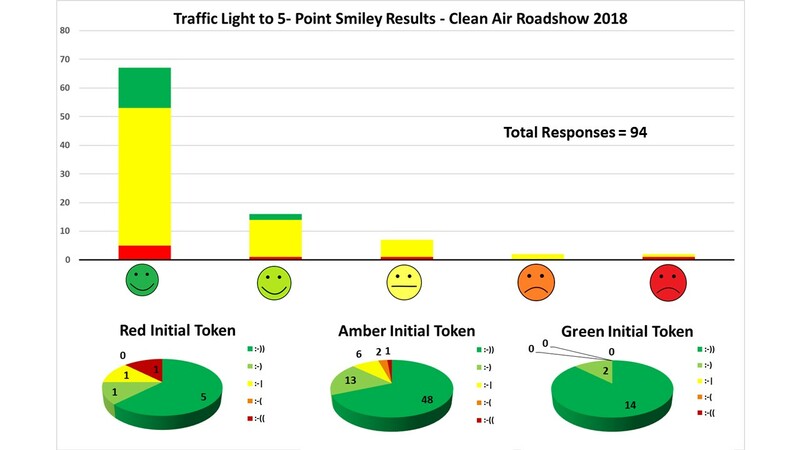 As expected the large majority of people without prior opinion, (Yellow tokens) were persuaded that hydrogen was a positive thing overall. 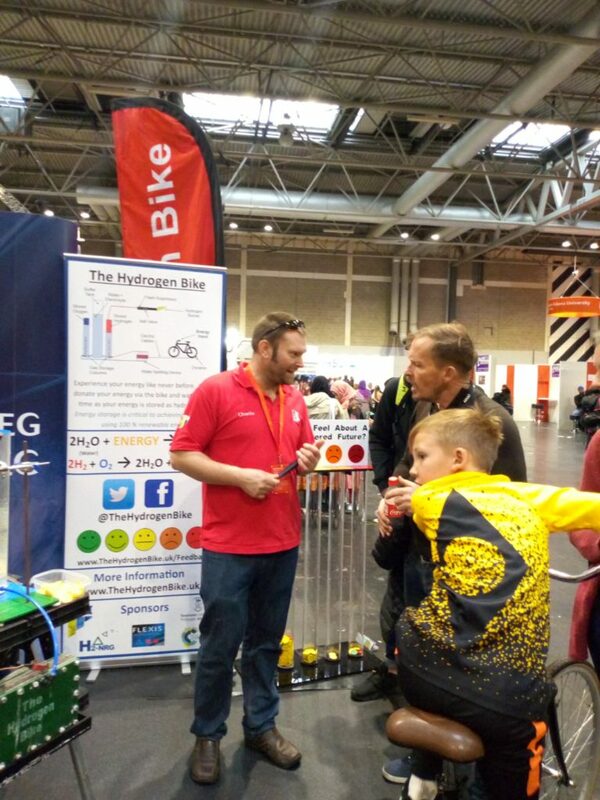 1 yellow token was placed in the red indicating a decision that hydrogen is not good however this is mitigated by the fact that this small child just liked the colour red the best and didn’t quite get the concept. 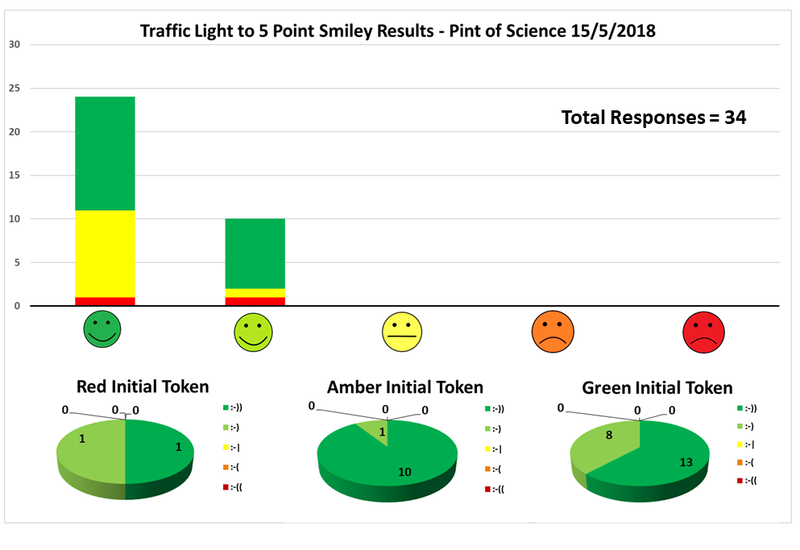 With a bigger sample pool of people these errors would be diluted..
Pie charts: Good positive impact from the red tokens, even though it was just 3 people. 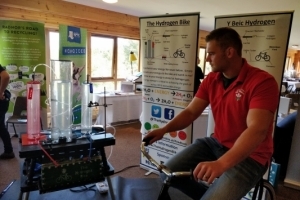 All raised their opinion of hydrogen technologies and it’s use as the future energy carrier. 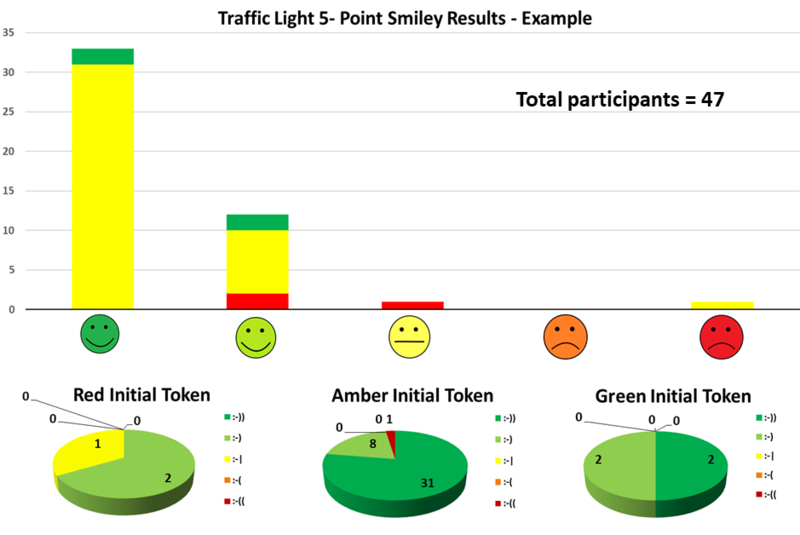 The yellow tokens which inevitably were the largest group showed quite a very significant move away from the yellow smiley indicating that everyone had an opinion post event which is good impact. 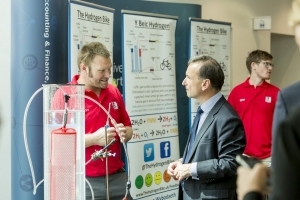 this was massively positive towards hydrogen. 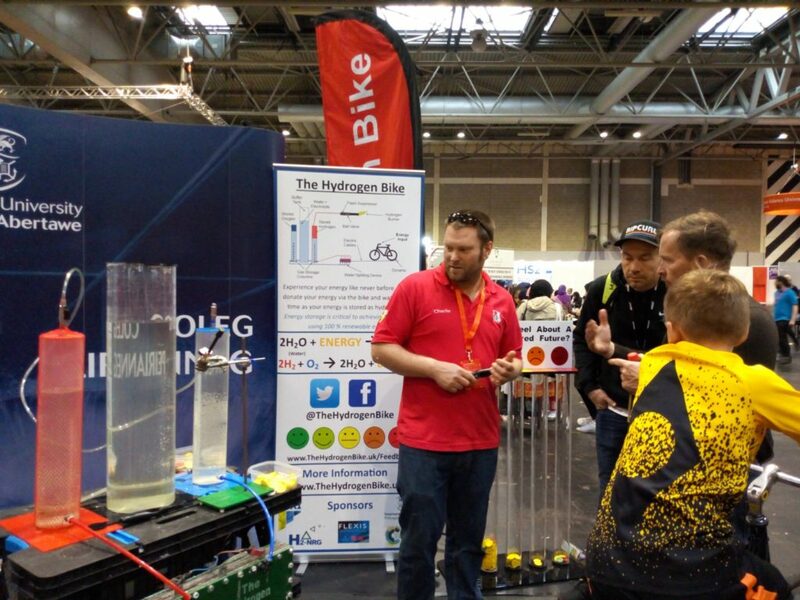 The 4 people who knew about and liked hydrogen didn’t change their opinion as a result of the event. 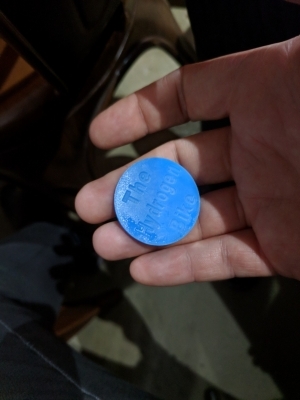 Note: for those of you reading this after attending the event the actual tokens used on the day were pink, grey and blue. These correspond to the data for the yellow, red and green.